Well here we go. She had a baby and here come the baby posts. 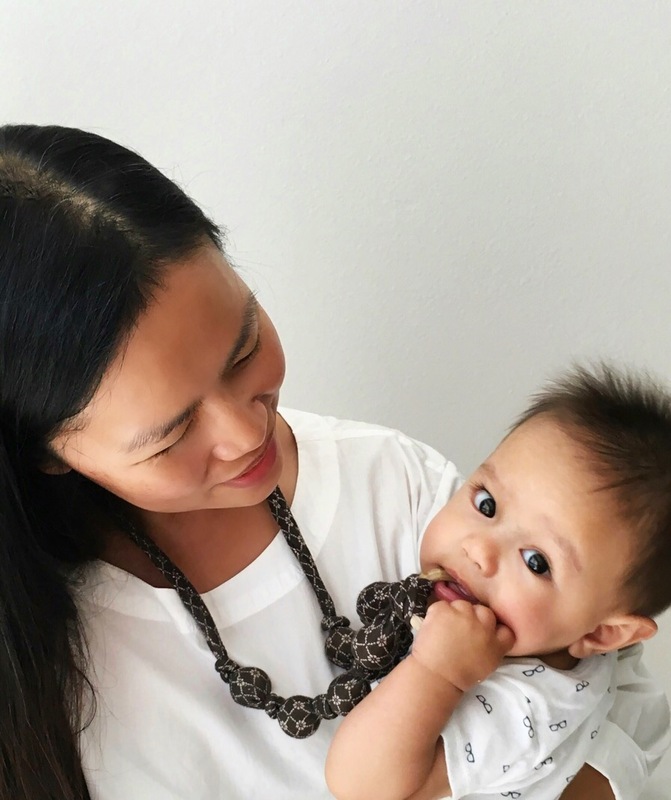 Guilty as charged, but I promise you that I will continue covering my broad range of topics (hence, the name change) and that I haven’t completely diverted from my non-baby life….yet. Today’s DIY is brought to you by the Drooling Babies of the World, namely, mine. 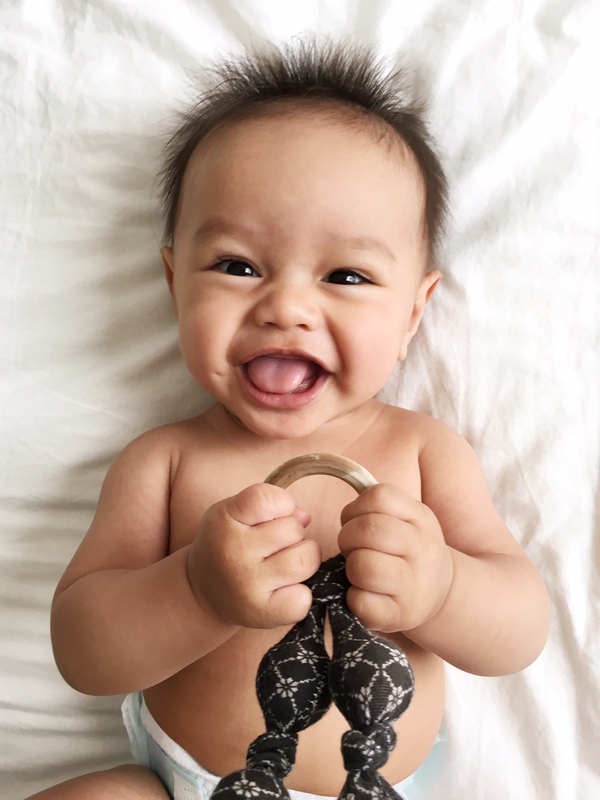 When baby hit 3 months, his mouth turned into a faucet that can’t be shut off. I don’t know where he keeps all that fluid. IT IS ENDLESS. 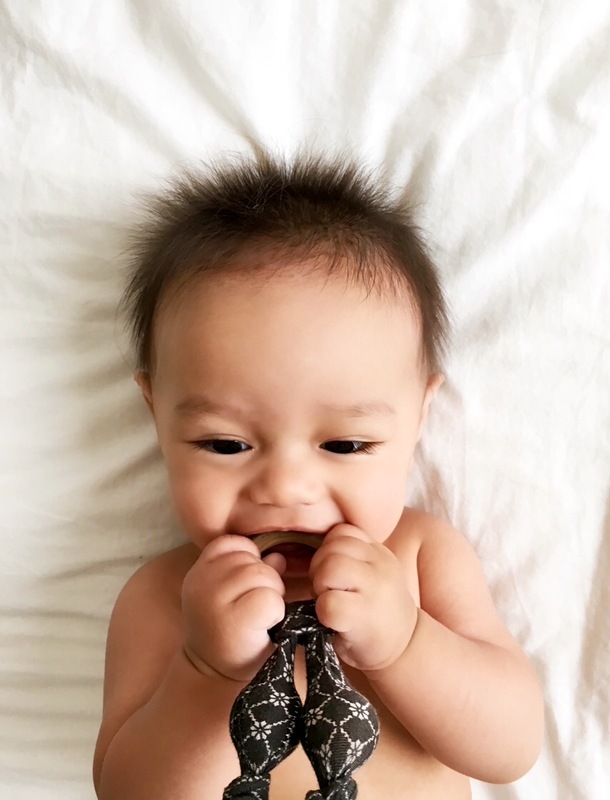 Drooling is an early sign of teething. Also, wanting to put EVERYTHING in his mouth is a sign of teething. 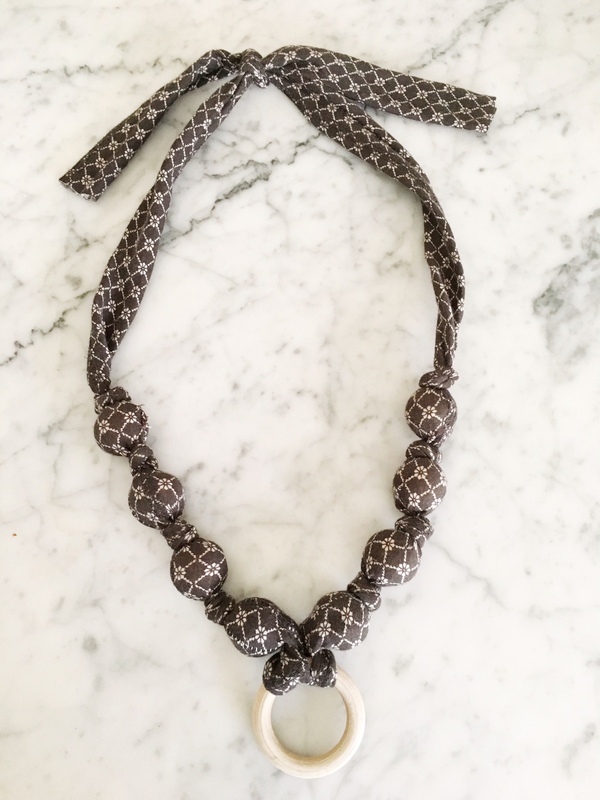 Since mamas deserve to look good while taking care of a drooling teether (or a teething drooler), here’s an easy necklace to put together that teether/drooler will love (…..putting in his/her mouth). 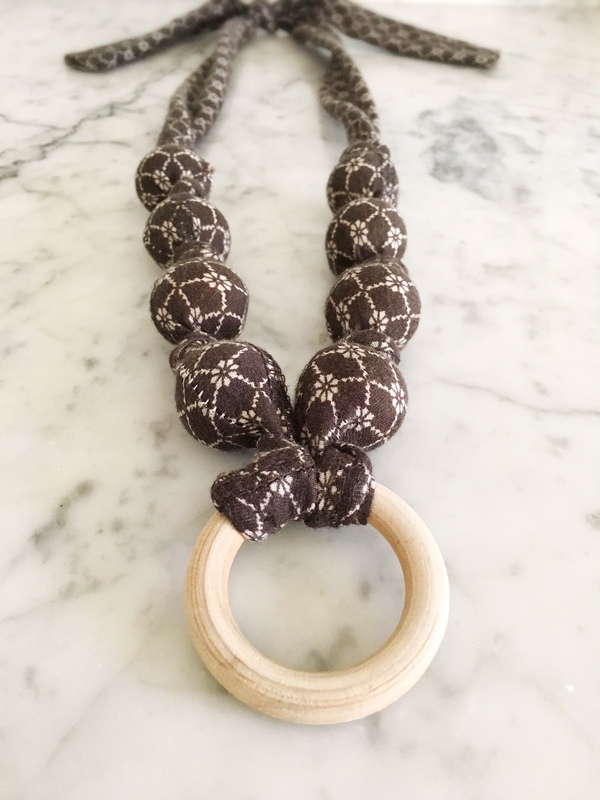 As for the non-mamas out there, you can still rock this necklace with any outfit. I used a strip of fabric from the bottom of a skirt, because EVERYTHING is far too long on me. The retail industry still thinks everyone is 5′ 7″ tall, and petites are left with slim pickings. So I’ve become Alterations Lady. I cut all my clothes to fit my shorty goodness. Yes, I said shorty goodness. 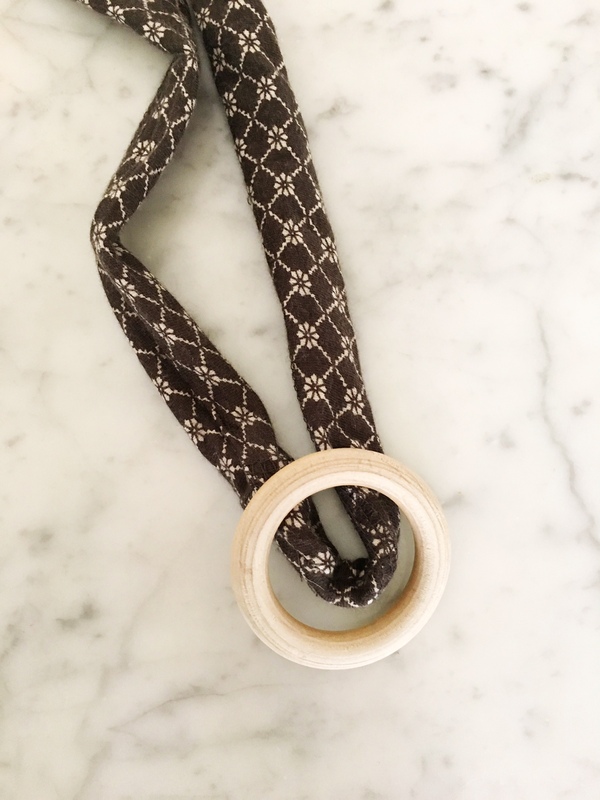 Start by making a casing with the strip of fabric. Allow at least 2 inches for the balls to fit through. Turn the casing inside out (I used a chopstick to carefully fold the fabric into the tube and then pull it out the other end). 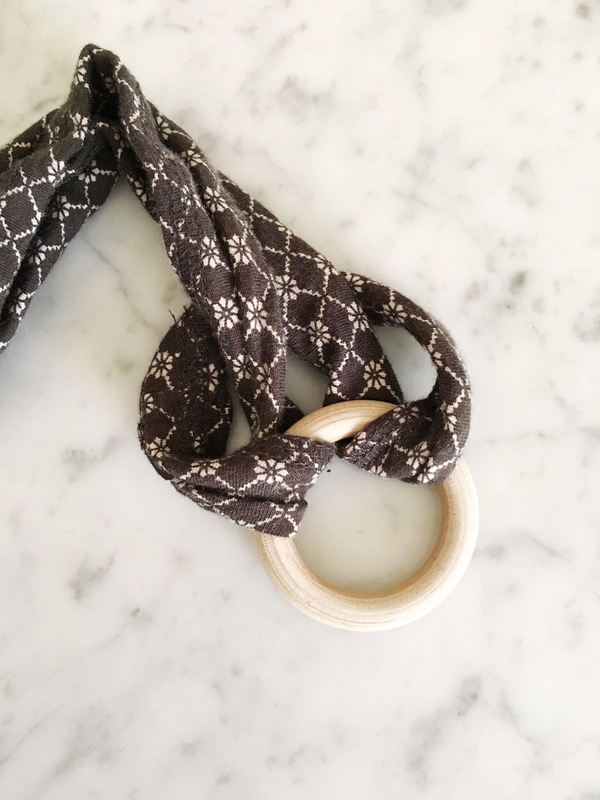 Fold the casing in half and attach the wooden ring. Make a little loop and pull the tail ends through. 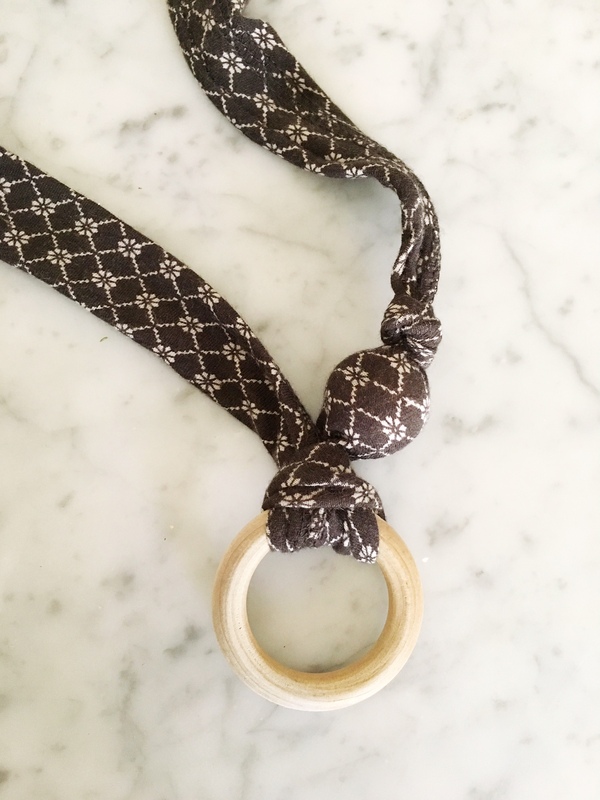 Insert the first wooden ball into the casing and tie a knot securely. 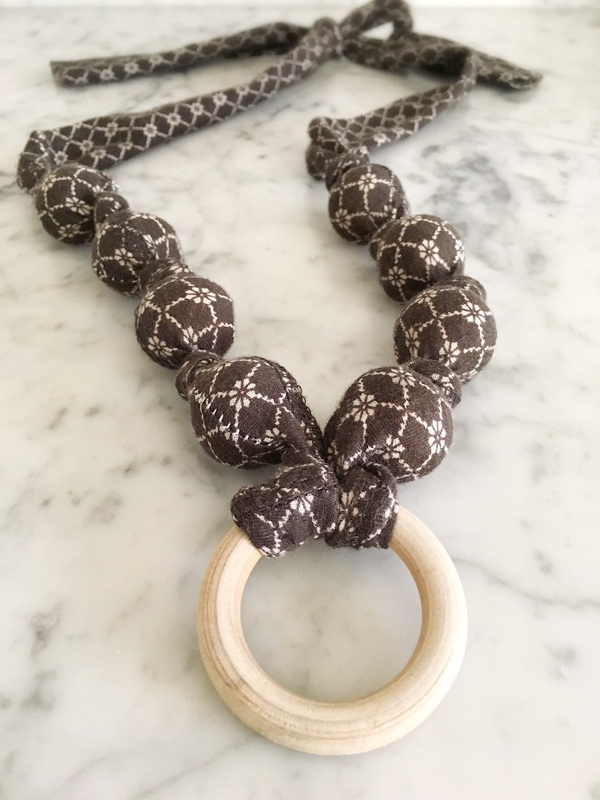 One of the known hazards of these teething necklaces is that if they’re not sewn securely enough, the balls can come loose and choke baby. If sewn well (use a tighter stitch gauge and tie the knot tightly) this shouldn’t happen. 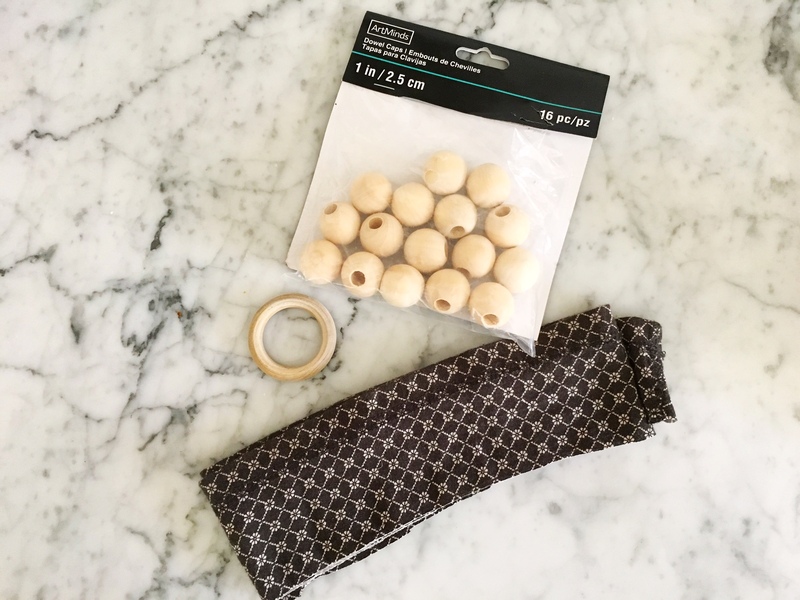 Keep going with the desired amount of wooden beads. Do the same on the other side. 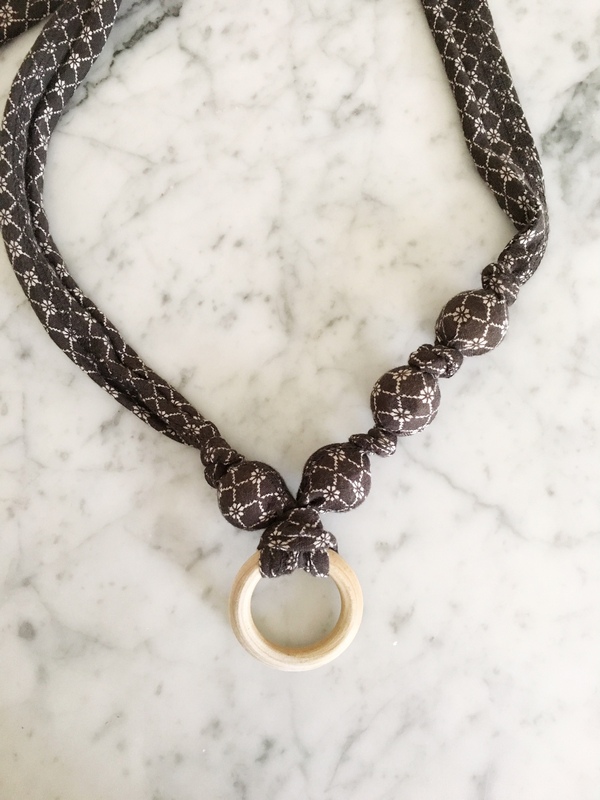 Tie a knot to secure the necklace and voila! I think it took me a total of 20 minutes. I KID YOU NOT. Wash in baking soda and a splash of vinegar. 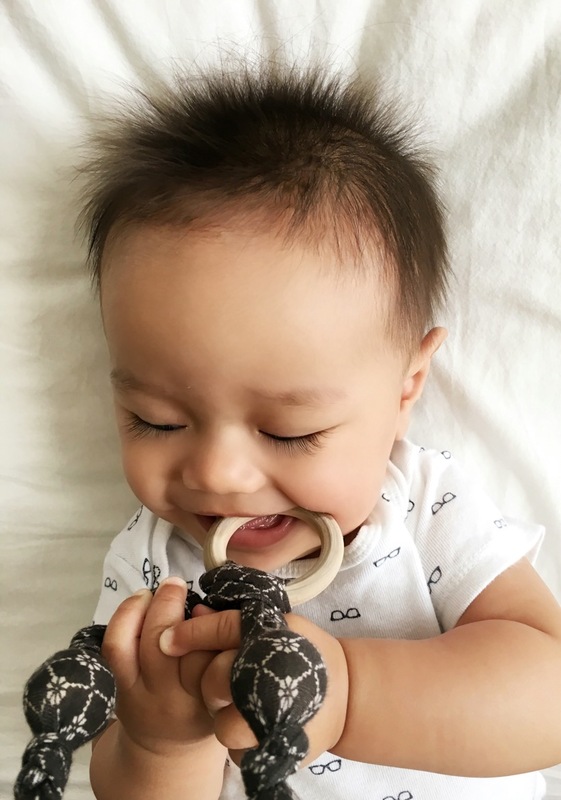 That’s a safe bet for anything baby plans to put in his/her mouth. Now for the real test…. Right into the mouth it goes. Success! If you don’t have a sewing machine and prefer to leave the stitching to someone else, there’s a no-sew option as well. But it requires a little sleuthing. 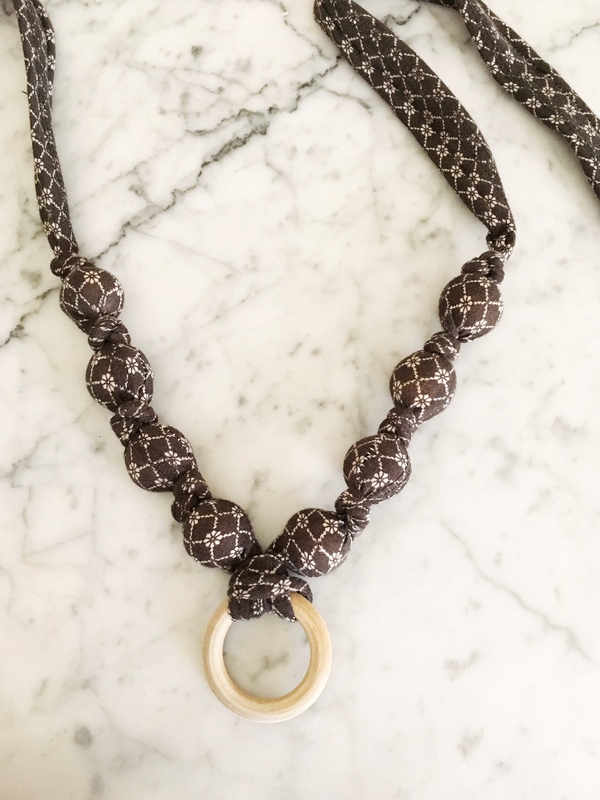 If you can find an old item of clothing with a deep enough hem, you can just cut the hem off, turn it inside out, and make your necklace. 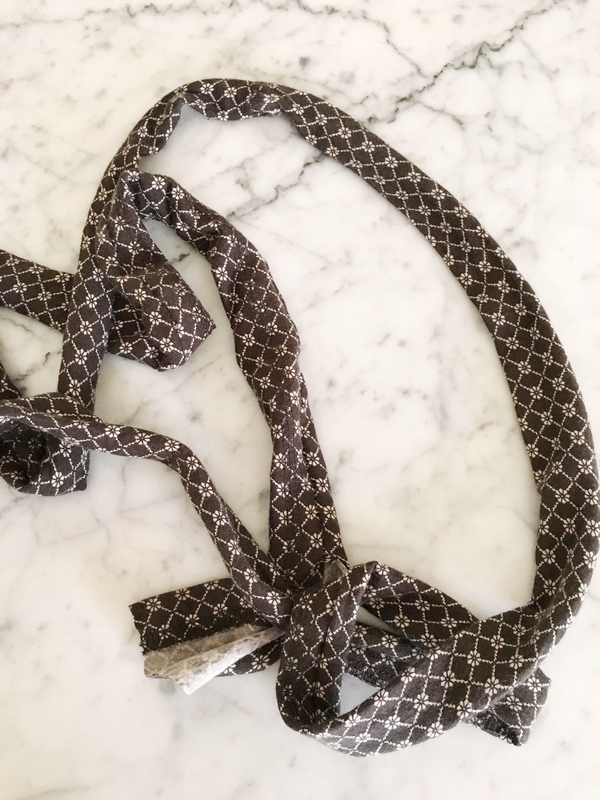 Alternatively, you can get an old pair of pants with a banded elastic waistline and cut that off, remove the elastic, turn it inside out, and make your necklace. I found a pair of pants that would work beautifully to exemplify my no-sew option, but hubby wouldn’t let me cut up his comfy pajama pants. Drats. If you aren’t the DIY kind, you can visit the Vintage Honey Shop to purchase one. Your model really knows how to sell the product!